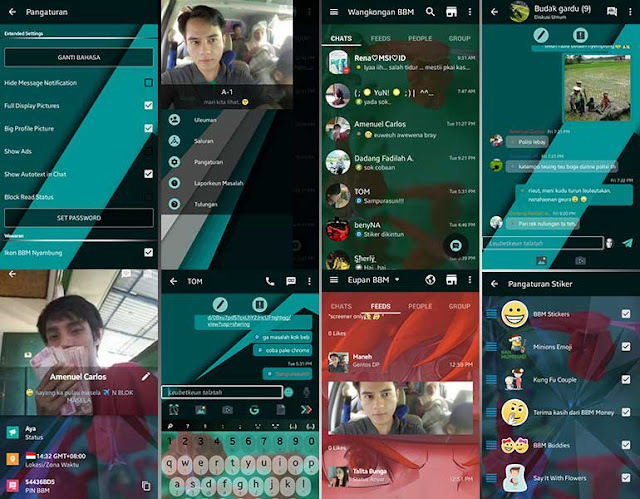 This BBM application has been extended with privacy protection features, such as hide message notification, block read status, and lock the bbm chat with password. The hide message / chat notification will hide the chat content from the android notification panel as well as the scrolling text at the top of the phone. This new feature should be useful if you lend your phone to someone and you don't want him / her to read the incoming message. This great BBM application is BBM Essential v2. While the Block Read Status is useful to see someone chat message and read it without sending the R sign (Read), so your contact may think that you haven't read it. Cool isn't it? And more than that, this BBM modded app has also the Lock mode that allows you to hide all the BBM application interface. But wait, that's not all. There are bunch of other extended features, read on. Multi Lingual Option (Indonesia, English, Silly Sundanese, Javanese). Developers are pleased to add your own language. Please note, this BBM Essential v2 are available in two versions, uncloned (original) and cloned. The uncloned version will replace your official bbm application, while the cloned version is a standalone application with different signature and process name, so you are able to use multiple BBM app in single phone at once. Check the "Unknown Source" since it's not installing from playstore. Some features require your BBM application to restart, so don't get confused as it is normally fine. Or if you need a lighter BBM app, please try the previous version of the app here Cool BBM App with Extended Features. Thank you for reading and I hope You like it.